Social networks are among the busiest communities on the planet. With that much going on, it’s always going to be difficult to get noticed. Being clever with your social schedule can drastically improve your visibility and engagement. You’re going to have to think about this on a per network level. We know that different networks react better to different kinds of content, and that different demographics are more likely to be found on different networks. By using the right combination of factors, you can get the right content in front of the right people at the right time. There are lots of tools out there that can help you schedule your Tweets, Facebook posts, and Google+ posts. This is only a side note as we don’t have the time to go into all the different tools. Personally, however, I use TweetDeck for scheduling my Tweets and HootSuite for Google+ and Facebook. 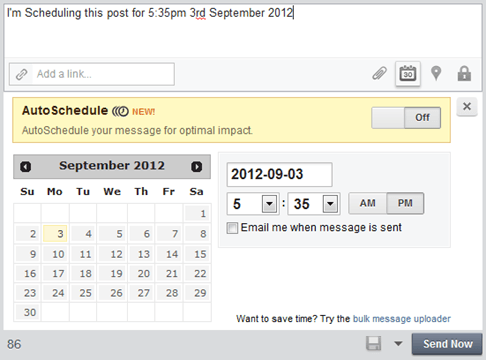 You might already be scheduling your posts and have your own set of tools laid out. That’s fine. The rest of this guide will be useful regardless of what program you use. But if you haven’t got any scheduling tools yet, I can’t recommend these two enough! With Twitter, you have the help of an incredibly useful (and free!) tool in the shape of SocialBro. It’s useful for all sorts of things, but let’s focus on scheduling. 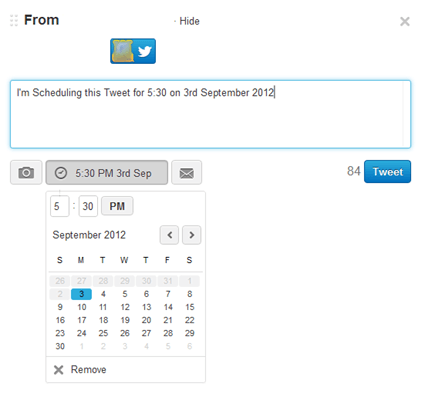 The “Best Time to Tweet” function gives you a detailed report of your follower’s activity: When are they online? Which days are they most active? When do you have the most potential exposure? This data is invaluable when deciding when to Tweet. I usually use a combination of factors. Look at when your followers tend to be online. This is much easier if you are only catering for one geographic market, e.g. U.S.A. or U.K., but it becomes much more difficult when you are operating globally. Try to spot the spikes and send your tweets around those times. Then you can combine that data with when you are getting the most RT’s and Replies. Look for any synchronization between the two. That is your ultimate sweet spot. If you’ve got a killer piece of content that you want to post, that’s the time to do it! Using Tweetdeck makes things extremely easy. Write your Tweet, click the clock-looking icon, and set your time. You can do this far into the future, although I wouldn’t advise setting your schedule more than a week in advance. Social media moves incredibly quickly, and you want to try and stay up-to-date! Facebook is a different network with different needs. Facebook traffic is highest between 9 a.m. and 4 p.m. (Thanks to bit.ly for their study.) There is also a ‘dinner time’ peak at around 7 p.m. Hitting both of these peaks is the way to go if you want to achieve maximum reach on Facebook. I’m sure you’re all aware of the Edgerank algorithm. We can improve your Edgerank by posting at the optimum time for your fans to drive up engagement rates. There is an element of testing involved here, as there is not the same amount of data available for your Facebook fans as there is for your Twitter followers. Try for a couple of weeks posting at around 1 p.m. and 6 p.m. Does that increase your reach in Facebook Insights? Now test a slightly different schedule. Try 2:30 p.m. and 7:30 p.m. Does that represent an even better schedule? Find six times that seem to work well and rotate them daily. Posting at exactly the same time every day will eventually become robotic, and you may be missing a number of fans who are active at slightly different times every day. This is definitely the most difficult network to get your schedule right on. However, with a little help from Google+ Timing, you can at least get a roundabout picture of where your posts have most impact. The app will rank the impact your posts have by hour and by day. 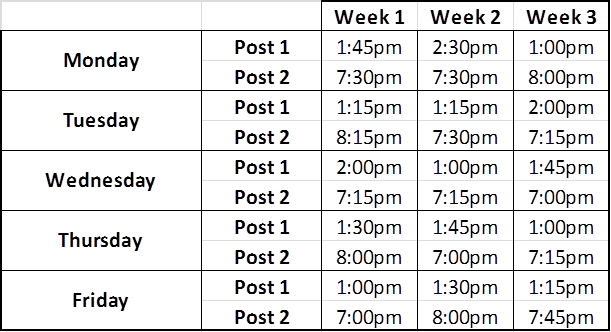 This should give you a great outline of when to post. However, if you’ve been posting at the wrong time, it won’t be much use to you as you will only be able to refine an imperfect schedule. I would be running some tests based on the data from Google+ Timing and noting which posts receive the most engagement. Consider where your users are from. The dinner time spike seems to apply across any social network, so test posts in that period of time, between 6 p.m. and 8 p.m. Sorry, I couldn’t give you a better plan with Google+, but it’s something nobody has perfected yet. Hopefully as time goes on and more data becomes available, we can generate a clearer strategy for scheduling posts on Google+. This is not a set-and-forget process. Far from it! I mentioned earlier on in this post about the importance of keeping up-to-date with social media. It’s a fast-moving industry, and you need to stay on top of things. Personally, I refine my schedule once a month. I test a few posts at strange times to see what the effect is. I see how many new followers or fans I’ve picked up from different time zones and try to include them in my thinking, too. Although some people may see scheduling as a way of operating their networks from afar, I would suggest at least being logged in and being able to receive notifications around the time that you post. Responding to people at the time you post is important. Near real-time communication can turn a fan into a real brand ambassador. Plus, people will know that you are actually putting thought into your posting strategy—it’s not just bots posting away all day long, advertising your products or services. An effective posting strategy has given me a much more organized day, where I spend less time worrying about what I’m going to post and more time interacting with people, which is exactly what Social Media is all about!